It often seems to be the way with me, that just as I feel like I’ve had a little bit of a break-through, I get injured. It’s happened time and time again over the years. 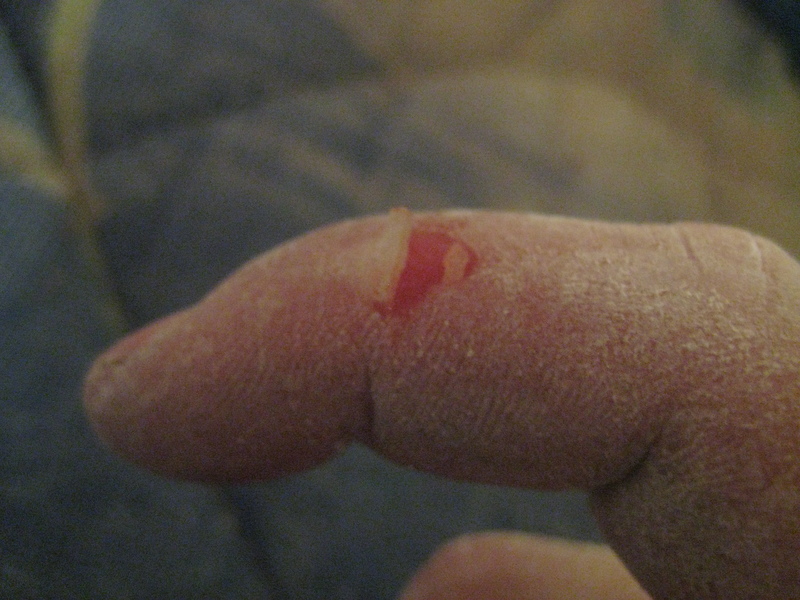 This time, just one day after doing My Kai and Master’s Edge I injured myself fingerboarding. 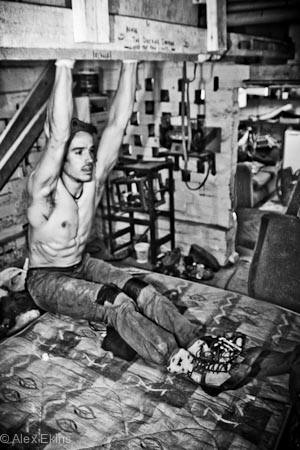 I was training down in my cellar doing some assisted one-arm hangs in safe grip positions. Nothing out of the ordinary there. Then, I had this sudden urge to see what my max full-crimp hang score was….Why?? I really don’t know. Thirty seconds later I had a sharp pain down my forearm and I knew it was game over for a while. Over the years I’ve been injured far more times that I’d like to admit to myself. It’s been absolutely soul crushing sometimes, but over time I’ve learnt a really useful skill: sideways motivation deflection. Every bit of psyche that I’ve got I’ll plough with total energy into what I can do without affecting my particular injury. The list of “sideways deflection” results during the last 5 years probably now reads as the few things that I’m actually quite good at; offwidthing, hand jamming, pinky hangs, core conditioning, and index monos. Back when the cool kids did core conditioning, not deadhanging. The ferocity at which I end up training and obsessing about these things have only been equal to the frustration that I’ve had in not being able to do “normal climbing.” So where did this leave me after the latest blow up? After 2 weeks of total rest, I spent some time testing what I was able to do on rock. I could do some pretty intense climbing on very steep rock (big holds on >45 degrees) and any amount of finger crack climbing. With hindsight, I can look at this injury as being a good thing as it reminded me of two goals this year. My Blackers Hole Projects and an Italian Trad climbing trip to Cadarese and Orco in April. With those in mind, I was back focused and happy! Firstly, I booked off a little time to spend down at Blackers Hole reaquainting myself with how pumped you can get on big holds. It’s totally mind boggling really as there’s hardly a crimp down there, but within 60ft your arms are exploding. It was brilliant fun though, finding that I could climb with no pain on such big holds, yet still explore a couple of new routes in the E9-10 range. Very, very psyched for this. The second half of my motivation has been directed towards making new steps forward in my crack climbing again. Pete Whittaker and I have come up with some devious ideas and some devious training methods! I love making these sorts of plans with Pete as he’s partly mad and fuels the fire for some insanely tough and unique training sessions. I’ve built around 40ft of new finger crack that’s got some amazing link ups and problems up to….. er….. well, quite a horrible grade. Flappers don’t come in the usual places now. So for over a month, I’ve been slogging it down to Blackers Hole and sweating away down in my cellar, with just a small dinosaur shaped paddling pool (and occasionally Pete) to keep me company. Last 10 days though, I finally felt like my injury was starting to not hurt on problems less than V6ish, so I headed out for a few days with the very talented Oli Grounsell and did The Bad and The Beautiful E7 6b, Fat Slapper E7 6c, Peas of Mind E6 6a and a rather nice 7c+/8a finger crack in Cheddar Gorge called Bursting the Wave. 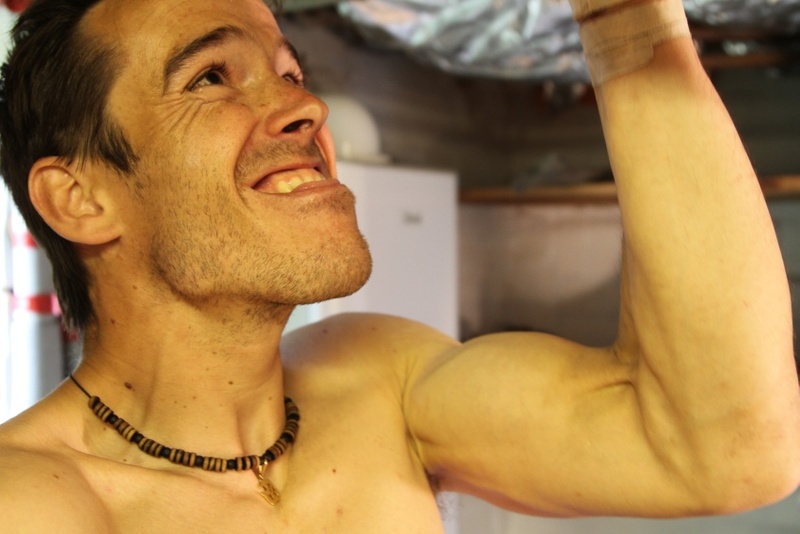 This entry was posted in Uncategorized and tagged blackers hole, crack climbing, finger crack, Gritstone, projects, training by tomrandallclimbing. Bookmark the permalink.